This fall, I am getting the opportunity to design and teach a graduate course for Boise State University’s Education Technology Program entitled, Social Networked Learning. The majority of students in the program are K-12 in-service teachers who are seeking ways to enhance their teaching with integrated and emerging technologies. I am so excited about what students are producing for this course and in terms of meeting this goal that I wanted to share information about the course, a sampling of course activities, and example student work. This course explores collaborative and emergent pedagogies, tools, and theory related to the use of social networks in learning environments. Participants gain hands-on experience with a variety social networking tools, create their own personal learning networks, and have an opportunity to develop a MOOC-inspired course for their learners. 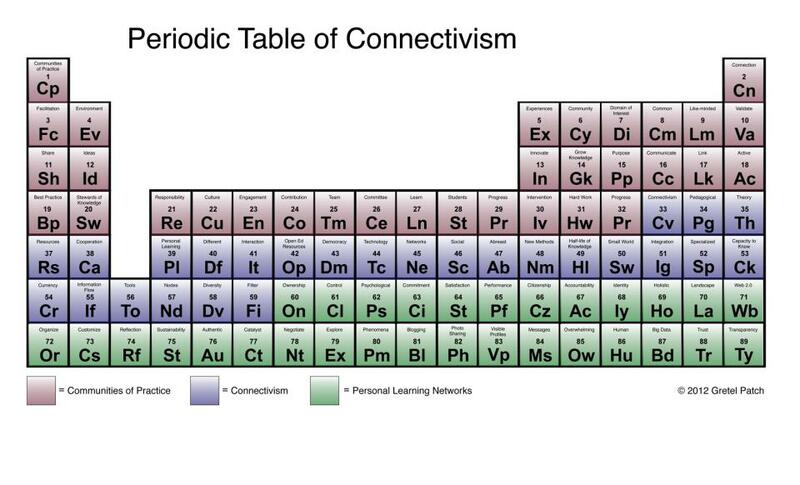 We are living, learning, and educating in an information-rich (Shirky), connected (Siemens), creative (Florida), participatory (Jenkins) culture. This culture is seeing growth, development, and evolution of information and technology as never seen before in the history of humankind. As such, educators need to become learners along with being teachers. Educators, in this age of teaching and learning, have a responsibility to connect with, learn from and with, and share resources and information with their students and other educators both locally and globally. 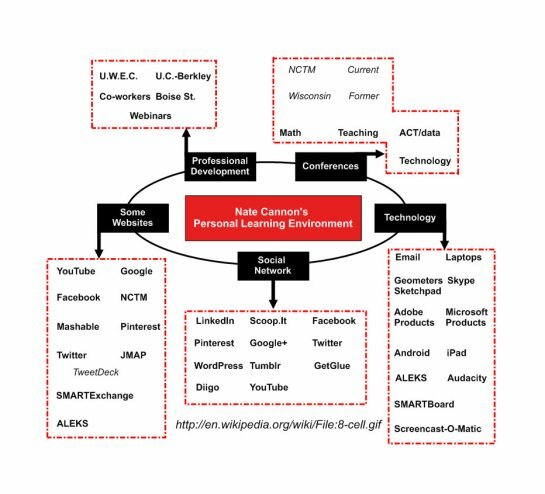 Use a Personal Learning Network, and explain its value in educational settings. Understand the value of web-based social networks within educational settings. Identify learning theories and researched-based practices that support current approaches to effective use of social network technologies for learning. Analyze strengths and weaknesses of various social networks and information management technologies for a variety of learning goals. Contribute to professional-based social learning networks using a variety of media and communication mechanisms. Identify factors with successful social networks, and create a social learning network-driven course for learners addressing these factors. During this module, you will be exploring communities of practice, connectivism, and personal learning networks. Understanding these concepts, philosophies, and ways of thinking provide a foundation for social networking. It can help you use social networks strategically and with intention. It helps inform your actions so you can use networks for engaged, participatory learning. Create one or a combination of the following to demonstrate your understanding of these concepts: a slide show or Glog of images, an audio cast of sounds, a video of sights, a series of handrawn and scanned pictures, a mindmap of images, a mathematical formula, a periodic chart of concepts, or another form of nonlinguistical symbols. Note that it is not about words but about images and symbols. Your product should contain the major elements discussed in this module: CoPs, Connectivism, and Personal Learning Networks. Include a reference page of at least 10 (ten) CoP, Connectivism, and PLN resources you used to inform your work. Creating a “product” to represent your understanding of the concepts addresses (1) that we have become producers as well as consumers in this age of social networking and web 2.0; and (2) according to neuroscientist, John Medina, visuals are very powerful means for learning and understanding. If you haven’t done so, set up a Twitter client (e.g. Tweetdeck). Find at least five hashtags that reflect your interests and set up columns for them on your Twitter client. Tweet out your chosen hashtags using #EdTechSN. Post a screenshot on our class Facebook page of your Twitter client with the at least five hashtagged columns (not including #EdTechSN). Include a summary of what hashtags you follow; three new things, resources, ideas you learned by following them; and your thoughts about about using Twitter as a form of just-in-time professional development. Your task for this assignment is to develop a specific plan for you as a professional to establish a positive professional online presence while at the same time developing steps to insure that your reputation remains “safe” and positive. Include at least 10 individual strategies. Use references to support your ideas/strategies. Post your ideas on a site that permits comments and feedback – you can create a video and upload on Youtube, a Voicethread, a Flickr slide series, a Facebook Page, a wikipage, or a Google doc (making sure you enable comments). Review the readings and resources about curation. Based on your readings, develop a checklist of at least 15 criteria that will serve as a tool for assessing the the quality and value of a curated topic related to your specialized content area and/or grade level. This is a group assignment – to be completed with the group you formed in the last module. Decide as a group which collaborative online tool you want to use to complete this list of criteria, e.g., Wiki, Google Doc, Primary Pad, etc. Reflect on the process of creating the checklist and working as a group in the comments section of their Facebook checklist post. 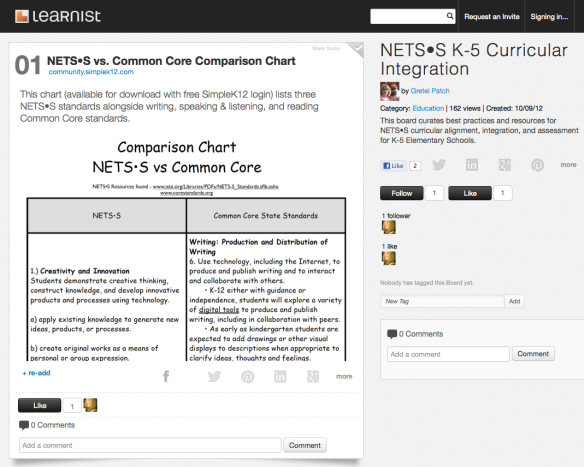 Using a tool specific for curation (e.g, Pinterest, Scoopit, Educlipper, Livebinders, Learnrist, MightyBell), curate a topic of your choice, applicable to your content areas and/or grade level.. This is an individual project. Include at least 25 resources. Use your group’s checklist to self-assess its value. Post your results in the comments section where you posted your the link to your Curated Topic. Use your group’s checklist to assess the curated topics of your group members. Please note what was especially noteworthy and also what needs further development/tweaking. Curating is hard work. To come up with this list of 25 acceptable resources involved a lot of filtering, sifting, and otherwise weeding out. It’s a tough job, but somebody’s got to do it. That somebody is me – and lots of educational technology professionals like me who take pride in their work. We do the hard stuff so you don’t have to. The end result is a resource I feel is substantial, helpful, and contributes to the greater good of knowledge. Gretel P.
Create a PLE diagram of your online communities. 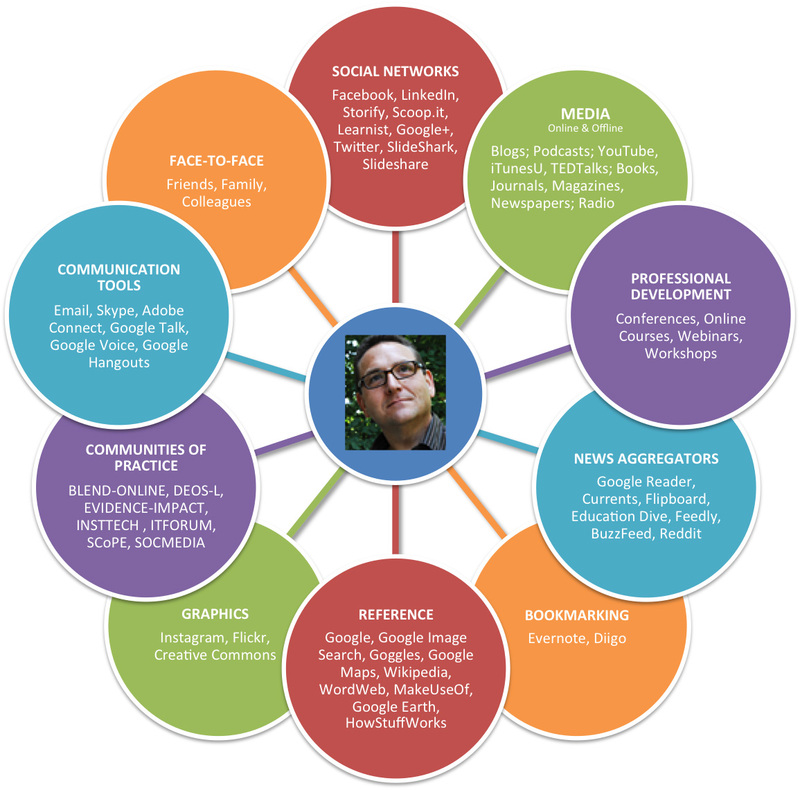 Represent at least 10 different online communities in your graphic and explictly show connections between the communities. You can be as creative as you’d like with this depiction. You can hand draw and take an image, or use any type technology. There are a number of mindmapping tools that can help you – http://www.educatorstechnology.com/2012/06/18-free-mind-mapping-tools-for-teachers.html Post a link and screenshot of your PLE so you classmates could view it on Facebook and Tweet your diagram out using the #EdTechSN hastag. Complete a reflection that addresses the following questions: What did you learn about yourself when looking at your PLE? Visit your classmates’ PLE posts. How does your PLE compare to other peers in class? Write a self-reflection and a comparative analysis that discusses similarities and diffierences between yours and your classmates’ diagrams. Either (1) develop social media policies for your learning environment, or (2) establish a plan to have your learning community develop social media policies for your school or organization. Include steps to get input and ideas from students, parents, teachers, staff, community members. While many teachers still choose to keep their head in the sand, the fact is that Social Media is in our schools. Moreover, that’s where it should be. There is no doubt that dealing with social media in a school setting is tricky business. Fears about students safety, cyber-bullying, reputation management, distraction in school and the like are real issues that should be addressed by school communities. More and more, this is being handled by the development of a Social Media Policy for the school or school district. This is an important part of creating a culture where students learn to use social media,, something they are already doing in the personal lives, in the space they spend so much of their time. By taking the approach of creating a policy that cultivates an understanding of the proper use of social media, schools not only protect themselves and their students, they also help students learn to better use such technology. Jon F.
I’m disappointed, though not surprised, to see how many districts and schools ban external social media sites completely. Sure, it may protect and cushion students, but it also creates a long-term problem of not helping students learn to navigate a world they are already using daily. Schools do students a huge disservice and only compound the problem by feeding school-life-home disconnect. Students will still use social media outside of school but are given virtually no practice to use it wisely and well – and certainly not for learning. I drafted a social media policy for our school and will present it to the Technology Committee for preliminary review and hopefully adoption. I believe it’s important to have this in place in addition to an Acceptable Use Policy, because 1) it states our belief that social media has a valuable place in our school; 2) it educates students, parents, and teachers on appropriate online behavior within social media sites; and 3) it helps ensure that everyone is accountable and safe. Gretel P.
Establish procedures for learners to join the platform. Establish some general acceptable use guidelines for your social learning platform. Describe some potential uses of this social learning network or online community for your content area and grade level. The final project for the course is for the established groups to develop a MOOC inspired course using the theories, strategies, and tools developed throughout the courses. This project will be discussed in a separate blog post. Wow, I hope these teachers understand how fortunate they are to be learning from you, Jackie. This is amazing. Thank you so much for sharing it. Can I audit? Looks like a great course. Thanks for sharing such an amzaing Course Description. I wished I could join it. Good luck! The course description makes me smile. It’s information that I take for granted, but that I learned gradually over many years. I’d be interested to know what kind of lasting influence can be had through a course on such material. Best of luck. I do think we take it for granted but based on their blog entries, they are having some major aha’s which is interesting to me as they are graduate students in EdTech. I am going to do my own end-of-course survey with Survey Monkey. You gave me the idea to send them a survey in about 6 months to see about more lasting change. What a comprehensive course! The social networks students build will be invaluable for PD. It might be helpful to have them reflect at the end about which types of social networks they found most useful. Do they connect best with a PLN on Twitter or ning or by commenting and receiving comments on blogs? What were some of the strongest relationships they built and how were they built? The more I use social media, the more I find that my way of making PLN connections reflects the way I make friends in the non-social-media world. It takes me awhile to build relationships. I prefer deep conversations with a few people at a time rather than smaller strands of conversation with a mass of Twitter followers. Connecting with bloggers through comments feels like going out for coffee (which I prefer) while Twitter feels like a party. The party has really interesting people and I enjoy visiting – but only for short periods of time. My use of social media reflects my introvert tendencies. 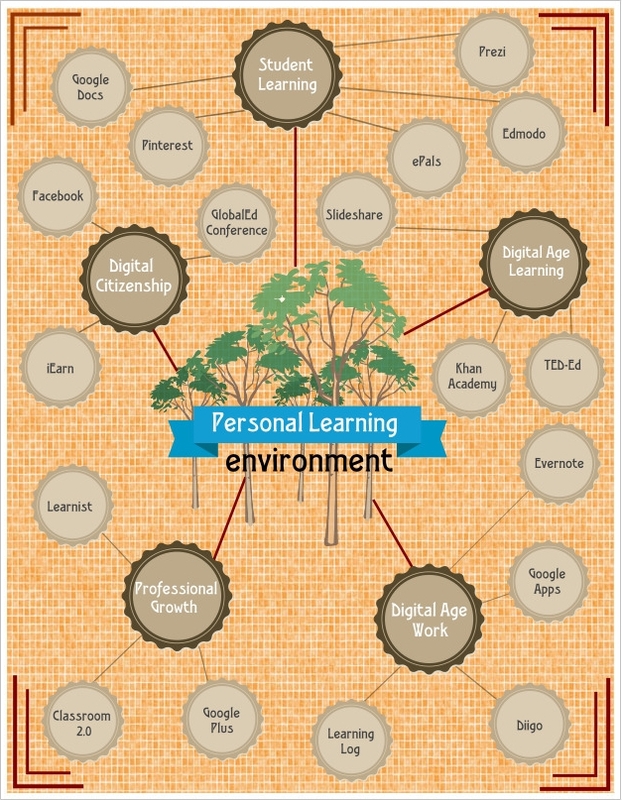 Do your students’ PLN actions reflect their personalities in the physical world? What does that mean for you as a lifelong learner? Love your comparison of the different types of social networks and personality types – maybe a blog post in there for you to write? I like the questions you proposed. I am doing my own end of course survey (as a form of action research) and plan to add them to the survey. Thanks for your insights! This is very impressive and timely. Thanks for your insight and detail.